Port Adelaide victor on his breakthrough win, presented by Maxima Racing Oils. 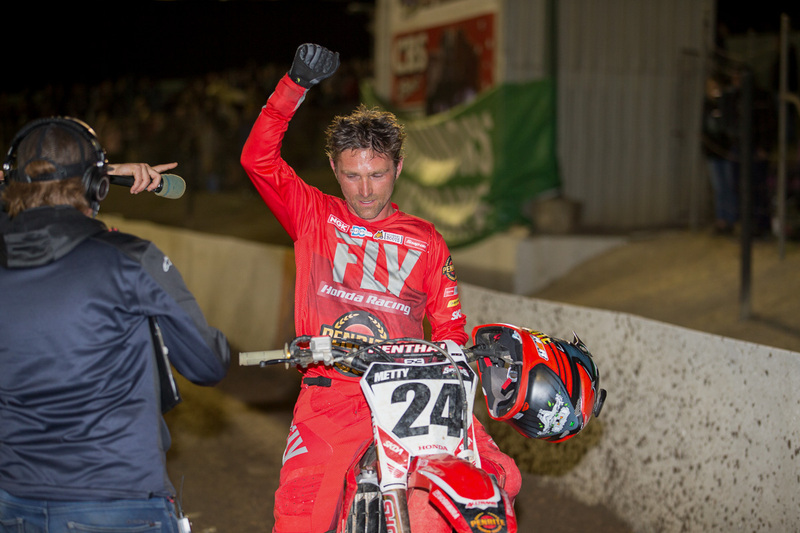 In front of a home South Australian crowd, Penrite Honda Racing’s Brett Metcalfe snatched an emotional overall victory at Saturday’s penultimate round of the 2018 Australian Supercross Championship in Port Adelaide. 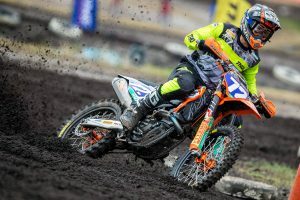 The number 24 has been on the cusp of victory all season long, and the triumph on the weekend placed him right into title contention as one round remains. Yeah, it’s been a huge week leading into it. The whole series I’ve been riding well – I feel there’s been a couple of things get away from me, but I’ve been consistently second. I just knew I had to step up and get to that next level – Justin [Brayton] is riding well and a lot of other guys are riding really well. Coming in I knew the hometown crowd would get behind me – I could feel it all week – the emotion and intensity was just building for me. I was able to finally practice this week, which was good – I got a day of practice in. The Penrite Honda CRF450R is awesome, so I knew it was going to be a good day for me. It started off well and I was competitive all-day, and when the gate dropped I was ready to go. You chipped into Brayton’s lead tonight, is the championship now more realistic for you now with the win under your belt and no doubt more confidence? 100 percent. Really, at the first round when I was on pace I felt like I actually let that one slip away when I stalled it – I feel like I could’ve ran for the win there. But since then, Justin has been on it – I had to make a difference here tonight to have any chance of the championship. Going into Sydney, there are going to be a lot of guys coming from the States, so anything can happen. I’m in a much better position now than what I was before this round. I’m definitely championship hungry – I’m focused. The track tonight looked like one of the best of the season in terms of layout and the dirt, is that something you thought too? 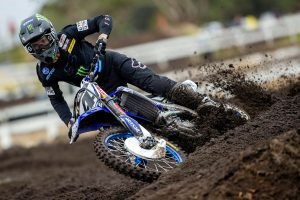 I would definitely agree that it’s been probably one of the best – the first two rounds were great, last weekend (Geelong) they were dealing with some things there and the track didn’t turn out so great. 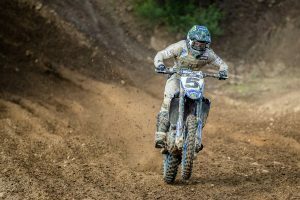 This layout was tight, and in practice I didn’t think it was going to be good, but the way the dirt and track formed with ruts and everything, it got technical – that’s what made it special and you could rise to the occasion – we had traction so you could really push and ride with intensity. Honestly, to get through those three main events and that first turn was just hectic. The first moto I got hosed in the second corner and pushed off the track – I was near last and had to fight for it to get back to fifth. I was able to get through the first turn good in the next two and bring it home. The Triple Crown format, are you a fan? As a rider, no. As a fan – if I was in the stands – I’d love it. Last weekend JB and I went into the last race tied on points with a win a piece, so it is cool and exciting to watch. As a rider and being 10 short laps, fitness doesn’t play into it, the strategy doesn’t play into it as much, and to do three starts with all the top guys together and get through cleanly is a bit of a roll of the dice. It’s hard to control everything in these races, so you have to have a bit of luck on your side and put yourself in good positions. The AUS-X Open is next and it’s going to be nice, tight and compact there. What are you anticipating in what will be your first appearance at the event? 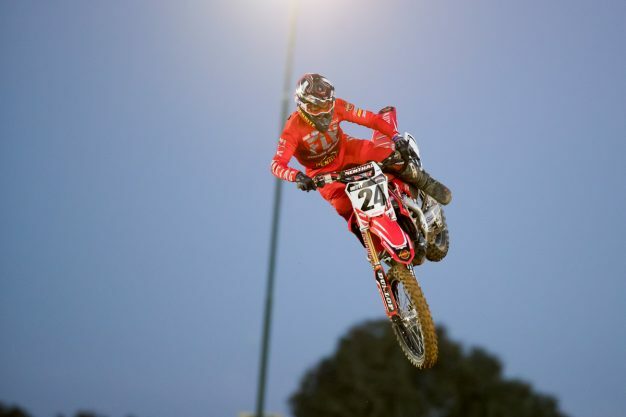 I’ve ridden there at Homebush – I’m actually undefeated there in 2000 and 2001 in the 125cc class [laughs]. I rode there and won both years in the 125cc class – I’m showing my age! I’m looking forward to that event and it looks awesome and exciting. The crowd is going to be awesome there. I’m just happy to be able to push this championship into a position where I can win.